Experience Yoga and the Beauty of New Orleans in a Whole New Way. Join us for weekly donation-based yoga as the sun rises above some of the city’s most coveted locations. We believe yoga should be accessible to everyone which is why classes are open to the public and no RSVP is required! Suggested donations range from $5-15 and can be made via cash or Venmo the day of class. Now you can also sign up for all of our sunrise classes via Class Pass! Rain Plan: Due to the nature of these classes being outdoors, in the case of inclement weather, please check NTY’s Instagram Page and Story and/or each classes' Facebook Page (links below) the morning of class to ensure that class is still being held. Join us for sunrise yoga at the most beautiful park in the city, under the Peristyle. 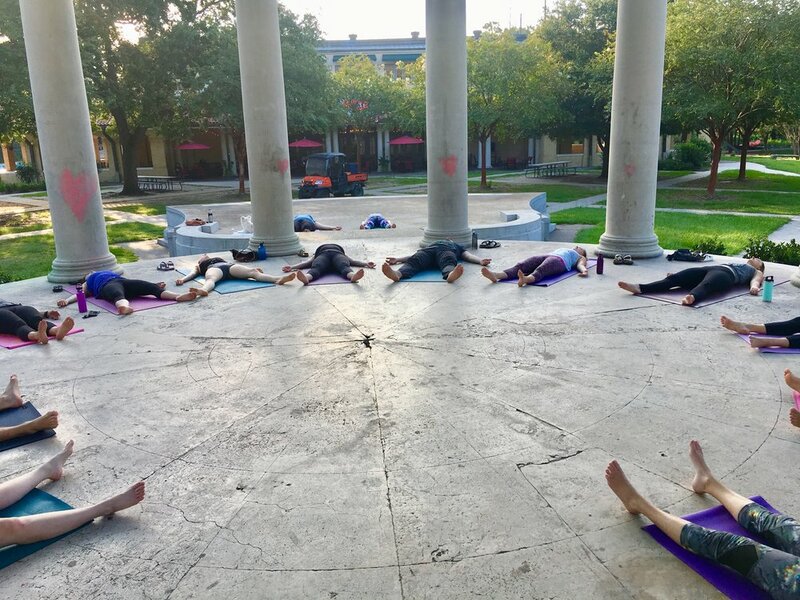 Kaitlyn will lead a 55-minute challenging, friendly, and fun, all-levels donation-based flow every Wednesday morning at 6:30AM underneath the Peristyle (42 Dreyfous Drive) in City Park!. Join NOLA Tribe Yoga for one of the most beautiful opportunities to practice yoga in New Orleans. Every Thursday morning at 6:30AM, join the tribe and your instructor Zoe, for a gorgeous 55-minute all-levels, vinyasa-style flow to the sun rising over the Lakefront. of breathing, challenging poses and balance. My favorite hour of the week is Wednesday morning at City Park for Sunrise Yoga." Thursday morning class on the lake. The start time (6:30am) is early, but it is worth it to see the sunrise. Our instructor is great, and each class is ended with a cold, scented towel on our forehead. Great way to start off a Thursday morning." yoga classes that are done in beautiful spots like city park, coliseum square, and the lakefront. There is nothing better than starting the day with the tribe feeling strong and centered before taking on whatever you have to do the rest of the day."